While you are having a residential security system installed, Hulk Security Systems can also provide installation of Veneer Covers for doors. This is genuine wood veneer that can be installed over plain aluminum doors at a third of the cost of door remodeling. While you are receiving the best home security products service, why not make the doors more appealing at the same time? Consider it a double-boost in home value. Residential security is the most important security consideration for many people. 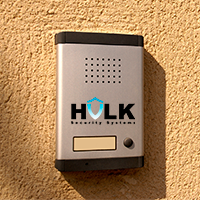 Business security systems are part of what Hulk Security Systems does with Expertise, but we take the same care with home security. At the same time, we care about the appearance of your home. Our veneer door cover service is incredible. Transform aluminum or plain wood doors into designer wood fishes in a day at a low cost to you. While you are having the doors covered with the Veneer, you can choose from our home security products to find new locks or even advanced access control systems for your outside doors. External door security is front line defense against intruders and should be an important consideration any time you want to add a home security system or improve upon an existing system. Now we offer you the best in security along with a little bit of a face-lift for your house. These Veneer door covers look amazing and they are easy to install, so the cost to you is minimal. Spruce up your home and tighten your security. You will be glad that you did. You and your family will benefit for many years to come.